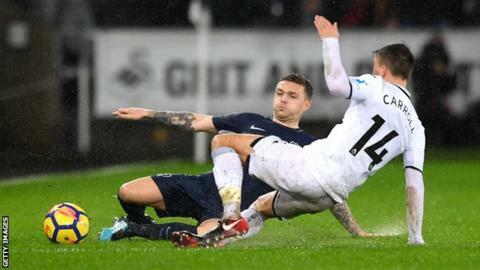 Tottenham overtook Arsenal as they climbed to fifth place in the Premier League table by defeating bottom side Swansea City at a sodden Liberty Stadium. With Harry Kane left on the bench, his deputy Fernando Llorente headed home against his former club from what appeared to be an offside position to put the dominant visitors ahead. Having initially set out to contain Spurs, Swansea grew in belief in the second half and had chances to equalise, most notably when Mike van der Hoorn's header hit the post. But after surviving spells of home pressure, Spurs launched an 89th-minute counter-attack and Kane found Dele Alli, who had his initial shot saved by Lukasz Fabianski before scoring with the rebound. Alli's goal guaranteed Tottenham's third successive league win and inflicted a first defeat for Swansea under new manager Carlos Carvalhal as the Welsh club stayed at the foot of the table, four points adrift of safety. Tottenham had not played since their 5-2 drubbing of Southampton on Boxing Day and Kane - who scored three of their goals against the Saints after his triple against Burnley - was seeking to become the first player to score three successive hat-tricks in English league football since 1946. However, the England striker was only named on the bench at the Liberty Stadium, having suffered with a cold in the run-up to the match. His absence did not adversely affect Spurs, and their early supremacy was rewarded with Llorente's glancing header from a Christian Eriksen free-kick. The combination of torrential rain, an unhelpful surface and an ultra-defensive Swansea side had the potential to make this a difficult evening for Mauricio Pochettino's side. But they made light of those factors with an authoritative first-half display, even if they created a relatively short supply of clear scoring opportunities. Tottenham's grip on the game loosened after the interval and, as Swansea threatened to equalise, Pochettino sought to swing the momentum back in his side's favour with the introduction of Kane. The man who scored 39 goals in 2017 was initially kept busy helping his side to defend but he eventually had his say in attack, lifting a fine cross-field ball to England team-mate Alli, who showed sharp reflexes to score after his first effort was saved. Swansea's manager Carvalhal had enjoyed a fine start to his reign, watching his new players mount a dramatic late comeback to win at Watford on Saturday just two days after the Portuguese was appointed. The Swans attacked with abandon in the closing stages at Vicarage Road but adopted a decidedly more pragmatic approach against Spurs, with Carvalhal switching from his favoured 4-4-2 formation to a defensive system that had five at the back. The same tactic had the desired effect in the reverse fixture in September when, under previous boss Paul Clement, Swansea held Tottenham to a goalless draw at Wembley. On this occasion, however, it was undone after just 12 minutes by their top scorer last season, Llorente, who nodded in from what looked to be an offside position. With simply shackling their opponents no longer enough, Swansea at least showed some attacking intent towards the end of the first half, with Renato Sanches curling a free-kick narrowly over and Martin Olsson shooting wide. Carvalhal's side had reason to be aggrieved again in the second half when Tottenham's Davinson Sanchez, who had already been booked, clattered Olsson but was not shown a second yellow card by referee Bobby Madley. Those contentious decisions fuelled a fiery atmosphere among the home supporters, and they were given reason to believe their side could force an equaliser as they mustered a flurry of second-half chances. Jordan Ayew dribbled past Eric Dier and goalkeeper Hugo Lloris but, as he lost his balance with an open goal in view, he was thwarted by a flying block from Spurs' former Swans defender Ben Davies. Van der Hoorn headed against the post moments later but, as Swansea took risks in their search for a late equaliser, they were picked off by a clinical Tottenham counter-attack to consign the home side to their 14th defeat from 22 Premier League games this season. Swansea City manager Carlos Carvalhal: "What I've seen is that I have a team with character and quality. They are brave and they fight for the points with discipline. Let's see if we can get one or two players in the market but if not the players we have will be brave and show commitment. I am a happy coach with my team. We can achieve points." Tottenham manager Mauricio Pochettino to MOTD: "When you don't kill games sometimes you pay and one thing can change everything so we were anxious to score the second. It was late in the game but we felt the happiness and the three points are massive. Now we rest and work in the video room because we have another game so soon." Dele Alli has been directly involved in six goals in his last six Premier League games for Spurs (two goals and four assists). This was Swansea's 11th defeat at the hands of Spurs in the Premier League (P14 W0 D3 L11); their most against any opponent in the competition. The Swans have won just one of their last 20 games against 'top six' sides in the Premier League (D4 L15), with that victory coming just under a year ago against Liverpool (3-2 at Anfield). Mauricio Pochettino's side have scored at least two goals in five of their last six Premier League games (18 overall - an average of three per game). Spurs have kept consecutive clean sheets away from home in the Premier League for the first time since September, in what were their first two trips of the 2017/18 campaign. Fernando Llorente has scored 11 goals in his last 12 Premier League appearances at the Liberty Stadium (10 of those for Swansea). Since the start of last season, only Romelu Lukaku (nine) has scored more headed goals than the Spaniard (eight) in the Premier League. Christian Eriksen provided the assist for Spurs' opener with what was his 44th for the club in the Premier League - only Mesut Ozil (47) has made more in the competition since Eriksen's debut (September 2013). Match ends, Swansea City 0, Tottenham Hotspur 2. Second Half ends, Swansea City 0, Tottenham Hotspur 2. Corner, Tottenham Hotspur. Conceded by Wayne Routledge. Attempt missed. Alfie Mawson (Swansea City) header from the centre of the box misses to the left. Assisted by Renato Sanches with a cross following a corner. Corner, Swansea City. Conceded by Eric Dier. Goal! Swansea City 0, Tottenham Hotspur 2. Dele Alli (Tottenham Hotspur) right footed shot from the centre of the box to the high centre of the goal following a fast break. Attempt saved. Dele Alli (Tottenham Hotspur) right footed shot from the centre of the box is saved in the centre of the goal. Assisted by Harry Kane with a through ball. Offside, Swansea City. Martin Olsson tries a through ball, but Jordan Ayew is caught offside. Attempt missed. Martin Olsson (Swansea City) left footed shot from outside the box misses to the left following a corner. Attempt blocked. Luciano Narsingh (Swansea City) right footed shot from the right side of the box is blocked. Assisted by Jordan Ayew. Attempt blocked. Jordan Ayew (Swansea City) right footed shot from the right side of the box is blocked. Attempt saved. Eric Dier (Tottenham Hotspur) right footed shot from the centre of the box is saved in the centre of the goal. Assisted by Kieran Trippier with a cross. Corner, Tottenham Hotspur. Conceded by Mike van der Hoorn. Attempt blocked. Harry Kane (Tottenham Hotspur) right footed shot from the centre of the box is blocked. Assisted by Dele Alli. Foul by Renato Sanches (Swansea City). Renato Sanches (Swansea City) wins a free kick in the attacking half. Substitution, Swansea City. Wayne Routledge replaces Tom Carroll. Attempt missed. Son Heung-Min (Tottenham Hotspur) right footed shot from the left side of the box is close, but misses to the right. Assisted by Kieran Trippier. Substitution, Tottenham Hotspur. Moussa Sissoko replaces Erik Lamela. Corner, Tottenham Hotspur. Conceded by Alfie Mawson. Foul by Sam Clucas (Swansea City). Substitution, Swansea City. Oliver McBurnie replaces Nathan Dyer. Corner, Swansea City. Conceded by Kieran Trippier. Corner, Swansea City. Conceded by Victor Wanyama. Attempt missed. Dele Alli (Tottenham Hotspur) header from the centre of the box misses to the left. Assisted by Eric Dier. Substitution, Tottenham Hotspur. Harry Kane replaces Fernando Llorente.